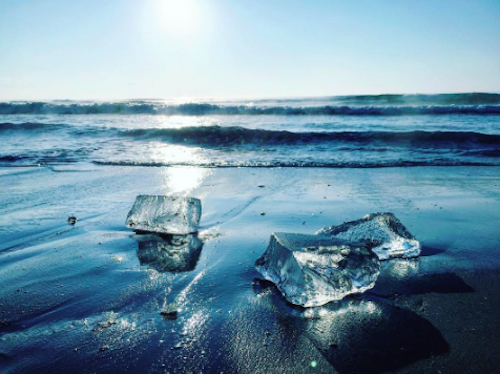 Imagine this: It’s winter, you’re walking along a beach, and beneath your feet are smooth and glittering chunks of ice that look like jewels. That isn’t a scene in a fantasy novel, but a real-life phenomenon that causes blocks of jewel-like ice to wash up on a Japanese beach every year. The dazzling ice washes up yearly on the Otsu Coast of Hokkaido, Japan annually. It happens when the mouth of the Tokachi River, which flows through the Japanese island of Hokkaido, partially freezes during the winter, causing chunks of ice to crack off and then float to the beach, where they sparkle – and eventually melt – in the sand. The ice has become something of a major tourist attraction for Hokkaido. Visitors can tour a museum dedicated to the drifting ice, attend an ice festival, or take a ship to see the floating ice blocks up close.